Enjoy one of the late Oli Herbert's terrific Guitar World lesson videos. This lesson can really strengthen one’s awareness of intervallic construction, scale recognition across the fretboard and virtually every aspect of one’s playing. Combine the minor pentatonic and Hirajoshi scales to create melodic lines that offer more harmonic-melodic variety. 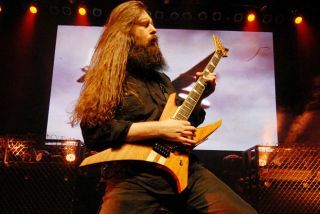 How to Play My Guitar Solo from All That Remains' "Victory Lap"
This month, I’d like to detail the guitar solo I crafted for the All That Remains song “Victory Lap,” as heard on 2015’sThe Order of Things. How to Play the Lead in All That Remains' "Pernicious"